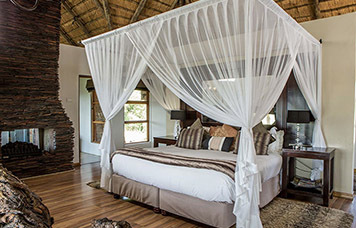 9 luxurious chalets and suites with panoramic views, freestanding, constructed with local materials and thatch. 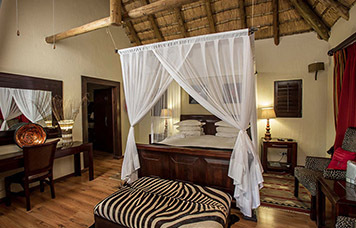 The air conditioned rooms are spacious and secluded with private viewing decks where guests can relax and observe the herds of zebra, wildebeest and impala as they graze below. The suites have been designed to allow maximum game viewing from every room with large picture windows looking out onto the valley. 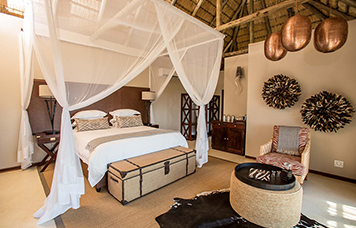 In addition to a private bathroom, each suite has an outdoor shower so that even while showering, our guests can immerse themselves in the sights and sounds of Nambiti. Showering in view of a herd of antelope or elephant is an unforgettably African experience! Each suite has a flat screen TV with satellite channels where you can catch up with a world that seems very far away – should you wish to! The perfect place for newlyweds or anyone who wants to feel like royalty. The extravagant stone bath with breathtaking views through large open windows is the perfect setting for relaxing, and soaking up the beauty of the African bush. The bedroom and bathroom add to the romantic atmosphere. The private deck is complimented by a jacuzzi for unwinding in lavish style. Our luxurious chalets have one large bedroom, perfect for couples. 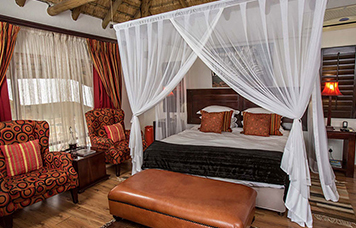 Families can be accommodated as we have pull out beds in the main bedroom. These chalets can also be made into twin rooms. Tucked away for complete privacy, the luxurious chalet has it’s own deck and private plunge pool. In total seclusion, guests can sip champagne as dusk falls over the landscape, lulled by birdsong and the majestic roar of the lions as they emerge to hunt. 4 beautifully decorated, modern luxurious suites. Set high on the hill top each with their own decks, and breathtaking views of the valley below, absolutely stunning. In total seclusion, guests can sip champagne as dusk falls over the landscape, lulled by birdsong and the majestic roar of the lions as they emerge to hunt.